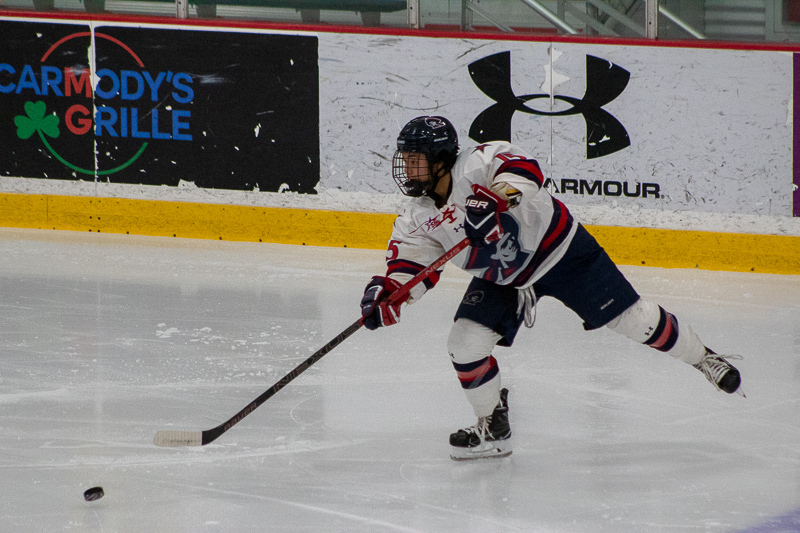 Sarah Lecavalier sends the puck towards the net as the Colonials battled the Saint Lawrence Saints in their first regular season series in October. MOON TOWNSHIP — After sustaining an elbow injury in the second game of their weekend series at Mercyhurst back on Oct. 20, Robert Morris women’s hockey (4-5-1, 2-1-1 CHA) forward Sarah Lecavalier is listed as week-to-week heading into this weekend’s matchup against the RIT Tigers (1-4-3, 0-0 CHA). According to a team official, the injury occurred when the junior forward absorbed a hit during the final game of the weekend against the Lakers. While she is not officially ruled out for this weekend, the main determination of her status will be whether or not Lecavalier is able to practice on Thursday. The University of North Dakota transfer is in her second year with the Colonials and has recorded one assist and 15 blocked shots so far this season. In 41 career games with RMU, Lecavalier has racked up 10 points (6G-4A) and a plus/minus of 13. RMU Sentry Media will continue to follow Lecavalier’s status going into the weekend as the Colonials look to continue their momentum after going unbeaten(1-0-1) this past weekend against Lindenwood.